With the Toronto Maple Leafs having just finished a season they would prefer to not remember for very long, Leafs fans are once again looking to the future in hopes of seeing a bright spot. One of the first things fans will be looking forward to is the upcoming NHL Entry Draft, in which Toronto is expected to have a very high selection. But instead of making a positive out of a negative, Leafs fans can also get excited about one of last year’s first-round picks. General manager Brian Burke and his staff felt good about taking a defenseman 25th overall, so they chose to select Stuart Percy of the Mississauga St. Michael’s Majors. Now that’s someone Leafs fans can look forward to. A native of Oakville, Ontario, about thirty minutes outside of Toronto, and around twenty minutes from Mississauga, Percy has thrived while playing in what you could essentially call his backyard. He’s put up solid numbers for the Majors, and has been an all-situations blueliner for the team. His 2011-2012 OHL season was derailed by a concussion, but in the 34 games he played for them this season, Percy produced 30 points with a plus-18 rating. Before playing major-junior, Percy played for the annual-powerhouse Toronto Marlboros of the Greater Toronto Hockey League. His talent in AAA hockey made him the fifteenth overall selection in the 2009 OHL Priority Selection, and he also represented Team Ontario at the 2010 World U-17 Hockey Challenge. Just last season, he helped lead the Majors to the OHL Championship series. It’s fair to say he’s played in high pressure situations for many years. 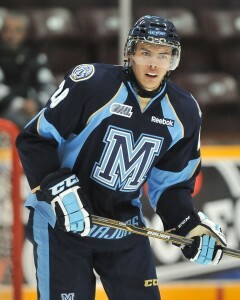 Fans of the Maple Leafs will be hoping his experiences will help him excel in the pro ranks quickly. The majority of Toronto fans will agree that there is a weakness not only between the pipes, but on defense as well. Percy is expected to help fix that. He was just recently called up to the Toronto Marlies of the American Hockey League after the Majors finished their season. While he isn’t expected to play on a regular basis for the Marlies in the playoffs, the experience in the professional lifestyle is something he’s expected to take full advantage of while he’s with the team. Percy is not, however, expected to make the Toronto Maple Leafs next season out of camp, but then again, neither was Jake Gardiner. Being a first-round pick automatically places high expectations on a player, but the Leafs will need to take their time with Percy, as like any other prospect, he’ll need time to develop. That doesn’t necessarily mean he’s destined for the minors come next fall though. Depending on whether he plays well enough in the preseason, it wouldn’t be a major shock to see him playing opening night if the Leafs can’t acquire defensive help in the offseason. Regarding his position in the Leafs’ pool of prospects, one could make an argument that he deserves to be considered in the top five. He’s without a doubt ahead of Korbinian Holzer and Brad Ross, but it wouldn’t be too much of a stretch to believe he’s a better long-term asset than Carter Ashton. As to whether or not he’s a better prospect than fellow 2011 first-rounder Tyler Biggs, it’s still too early to make that call. Though he’s not expected to become a cornerstone of their defense, Percy does have a complete, all-around game that will help him succeed in the NHL. At times he appears to be more of an offensive defenseman, while at others he looks like a stay-at-home blueliner. His role in the pros will likely be that of a two-way defender who can contribute on the powerplay. At the peak of his development, he’s expected to become a reliable second-pairing rearguard. For now, Leafs fans will just have to remain patient with him. His time will come.